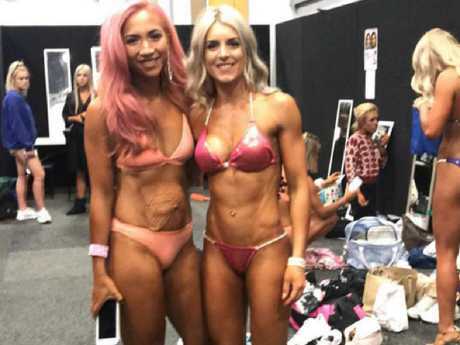 A MUM-of-two, whose post-natal depression was so severe she struggled to leave the house, is now competing in fitness competitions and proudly showing off her loose skin and stretch marks on stage. 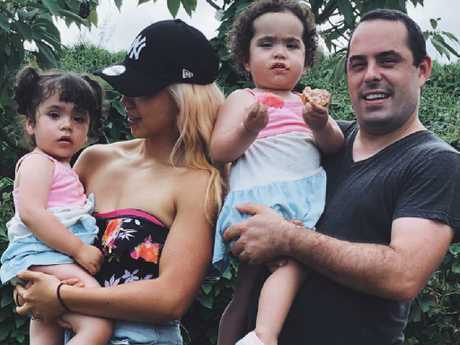 Shina Pierce, 29, from Auckland, New Zealand, welcomed twins, Harper and Nicole, with her partner Chris in December 2016 but initially struggled to cope with motherhood. 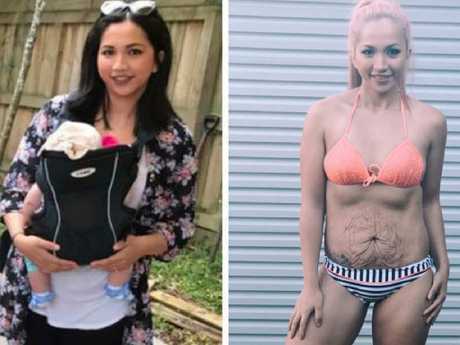 A keen fitness fanatic before she fell pregnant, Shina used to train between four and five times a week but gave up her regimen two months into her pregnancy out of fear she would miscarry. For the first few weeks of her daughters' lives, Shina had no energy and felt her lack of sleep was affecting her ability to be a good mother. Reflecting on that time, Shina said: "For the first couple of weeks, I'd break down and cry - to a point where it was almost every day for a couple of hours, for a while. "I was so tired, I felt like the worst person in the world because I couldn't deal with being a mother." 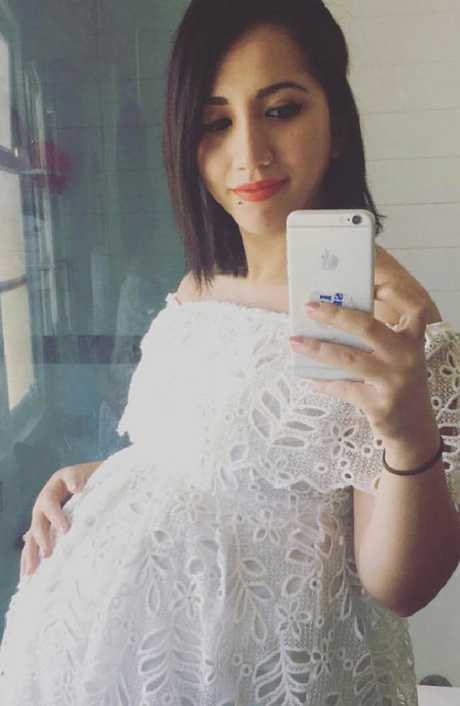 The young mum also experienced a difficult labour, lasting four days, which resulted in a second-degree tear. 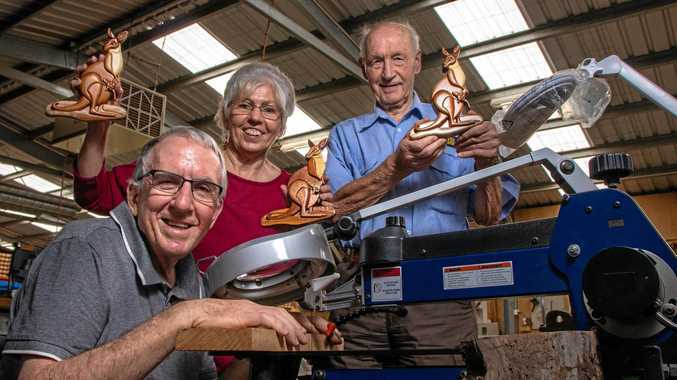 "I had no energy as I was getting up every hour for the first month or two, and I had a second-degree tear, and I found it hard to just move around or sit down," she said. 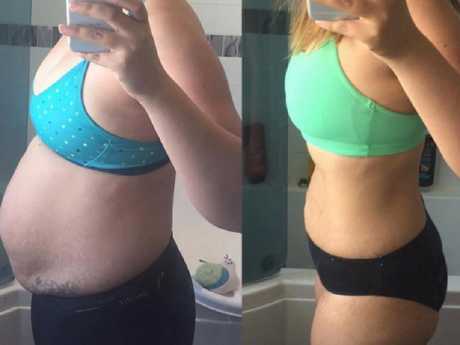 "I spent the first month recovering from the tear and surgery." Feeling exhausted, Shina also experienced shortness of breath getting down on and up off the floor, which ultimately made her wish for her pre-pregnancy body. Shina said she often found herself "puffed out" when she went on the floor for mat time with her girls. Getting up off the mat was a major struggle for her, which added to her feelings of disappointment.
" … I did remember how fit I was before and how a simple body movement like getting from the floor to standing up was never a problem until then," Shina said. "My midwife suggested to go outside and take the girls for a walk just to get out, but I was too tired and couldn't comprehend how to leave the house for the first three months." 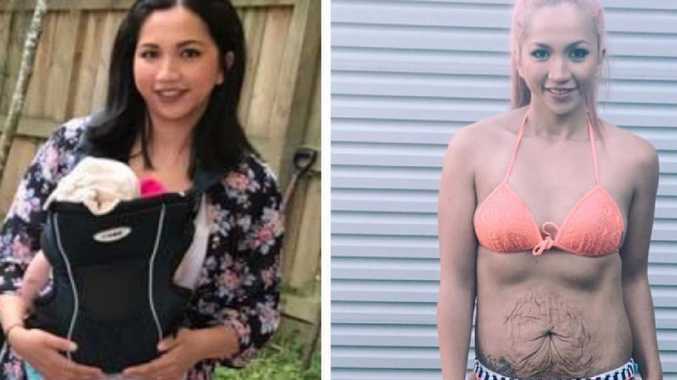 But eventually, Shina found the confidence to get back into fitness by taking her girls for a walk around her local neighbourhood in their prams. She also did 15-minute workouts at home. In the first three months of motherhood, Shina said she felt "incompetent", and as a result, she never wanted to leave the house. "But I managed in the end," she said. She now goes to the gym five days a week and continues to work out at home as well. After gaining 31kg over the course of her pregnancy, Shina is now back to her pre-pregnancy weight of 60kg and is a size 8. 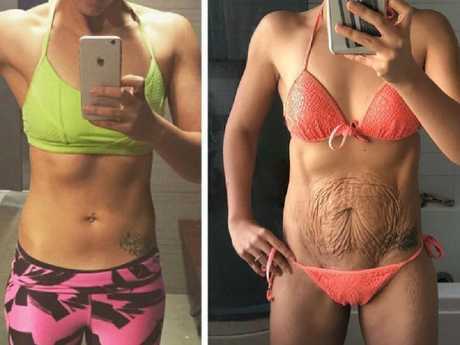 In a bid to inspire other mums, Shina has recently started entering bikini fitness competitions and proudly showing off her loose skin and stretchmarks on stage. 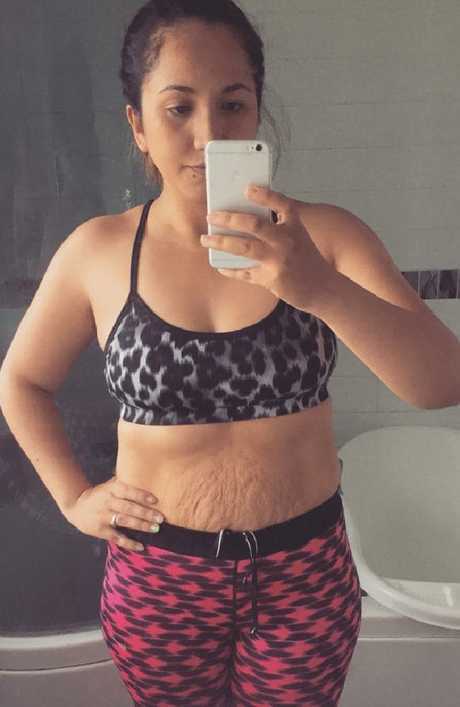 "I'm definitely proud of (my body), but there are definitely times that I wish that the saggy skin would disappear. 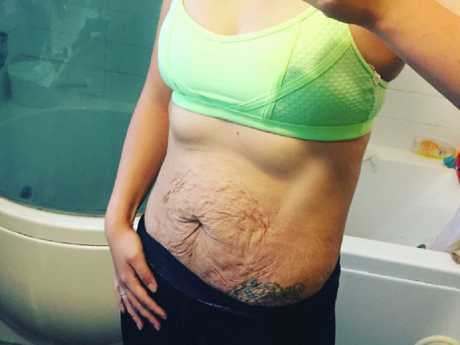 I actually don't care much about the stretch marks at all, it's mostly the loose skin," she said. 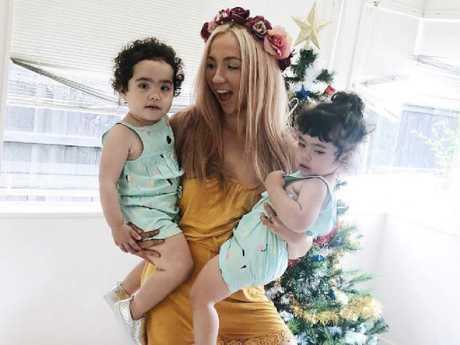 "When all the other mums and fit models were backstage, I was a little self-conscious because most of the girls and mums' tummies didn't really look like they had babies at all. "But I just had to remind myself that I did this for me. "I had to remind myself the reason I wanted to go on stage was to prove to myself that I can get out of my comfort zone and that I can do anything I put my mind to." Reflecting on her first year of motherhood, Shina said she loved her post-baby body and was proud of how far she'd come. "What I've learnt about being a stay-at-home mum and post-partum, I learnt that the best thing you can try to do is stay positive. As cliche as it sounds, there is a light at the end of the tunnel," she said.